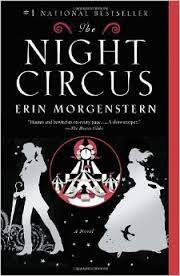 This is not ordinarily a book that I would have chosen, but a friend handed it to me saying, ‘you must read this.’ The Night Circus is a mysterious, magical book about ‘a thing,’ Le Cirque de Reves. It pops up in different places, and rumbles around the world, entertaining its visitors and reveurs. At the same time it is the stage of a complicated and drawn-out duel between two magicians. The Night Circus is set around the turn of the twentieth century, a time of great revolution in technology and possibility, and this fits well as the setting for the book. The story spans a 30 year period, and flits backwards and forwards, requiring the reader to have their wits about them. Chapters are short, in contrast to the feel of the book. The chapter headings are a delight, as are the second person intersections of the description of the circus. It is not a linear book, but this fits well with the magical theme and elements. Le Cirque de Reves is black and white, with light and shadow, love and hate, hope and fear. It is a truly fantastical place, where magicians work to create the impression of mere illusions. The prose is descriptive heaven, and Morgenstern’s writing is as captivating as the scenes that she creates: rich, lush and evocative. Her sense of place, of setting, of costume, of atmosphere is wonderful – and you can really conjure this extraordinary circus. The Night Circus is heavy on description and the plot is slow to unfurl, as time seems to get suspended in the circus. I was not sure if I wanted her to hurry up, or not. I loved the writing, so it was no hardship for me to roll with it, but a less patient reader may not enjoy being held in descriptive writing. The plot seems to advance through the development of the circus, and you know that there is a duel (established near the beginning of the book), but for a long time, the duellers do not know the game. The engine of the book is then this mystery about the circus, and it is when the characters are explicitly involved in it, that the book takes off. Morgenstern’s characterisation is good, but they develop later on in the book, when some readers might have given up. The roll of characters, with many different viewpoints, is an almost confusing number, so I half longed for a roll-call. They take their time to step forward from the shadows, as it is only near the climax of the book that they seem to cross paths and this is where the book gathers pace… just at the time you would rather it did not have to end. I finished the book wishing that I could have visited such a circus, and realising that perhaps I had already. Overall, a quite beguiling and magical read. I would recommend it.